We all know that jiu jitsu is practiced in a gi. On the other hand, the popularity of “no-gi” jiu jitsu has increased the use of rash guards. There is also a lot of benefits having a rash under the gi. 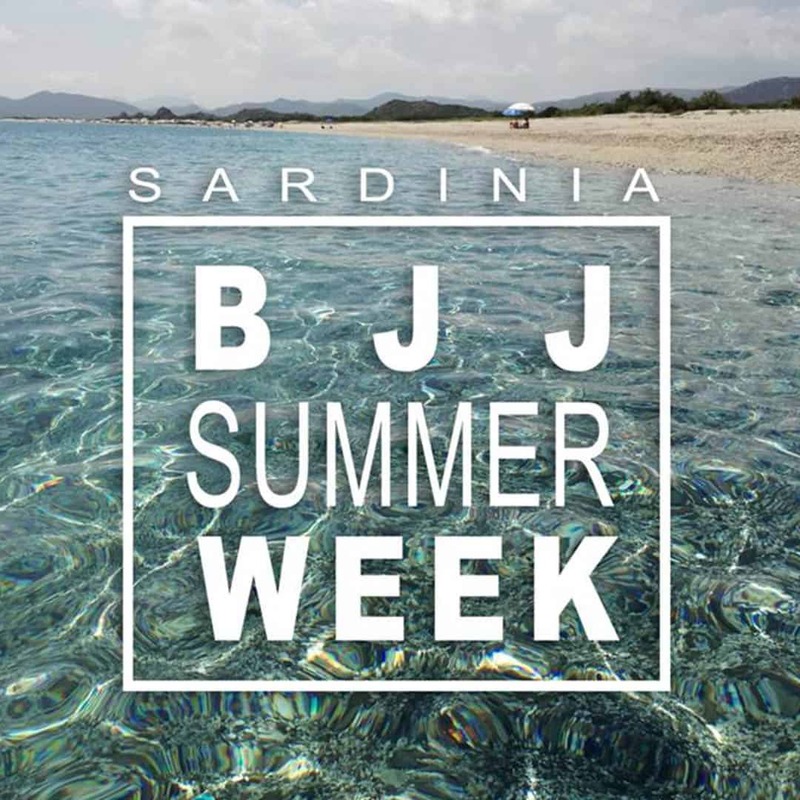 In the following article we are showing the benefits of wearing rash guard under the gi and best products that we found in internet. 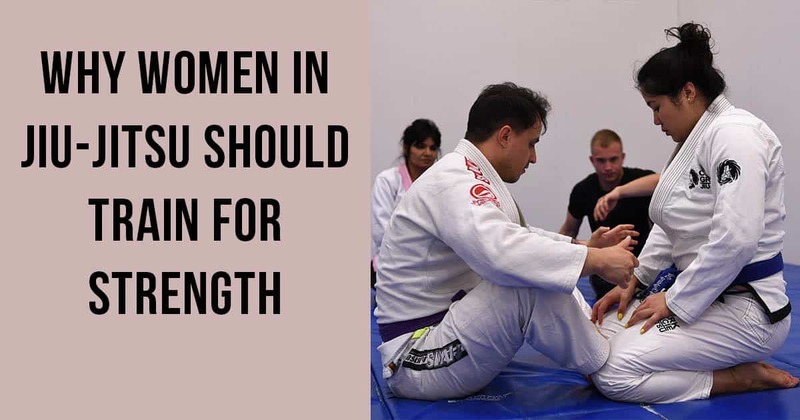 Protect Against Mat Burn – The BJJ mat can cause friction scars on your skin. Therefore, wearing a rash guard will protect your skin and reduce the friction because it is much smoother than your skin. Prevent Injuries – Wearing rash guards compress the muscles which can be very helpful when it comes to preventing some minor acute injuries. Minimizes Bacteria Spread – During rolling, the gi can open and leave your skin exposed to bacteria. However, when wearing a rash guard, your skin is protected from skin-to-skin contact and thus, from bacteria and germs. Controls Moisture – Due to their material (a polyester and spandex blended fabric), they control moisture. As a result, your hands remain dry and you can have better grips.After learning about the pros of wearing a rash, you should know that they come in all sorts of styles and designs. 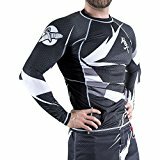 Therefore, we decided to present you the best rash guards for 2017 which can be easily found at Amazon. 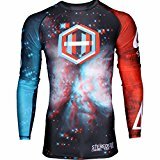 This rash guard is optimized for the highest level of athletic performance in BJJ, MMA, catch wrestling, no-gi, and submission grappling. It is made from lightweight, ultra-strong, moisture-wicking, compression material. 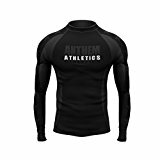 The Anthem Athletics MIDNIGHT Competition Rash comes with a multi-panel construction, high-density flat-lock stitching for optimal fit and durability. Moreover, it contains fully-sublimated graphics and logos that will never crack or peel. It is available in all BJJ belt colors: white, blue, purple, brown, and black and it will cost you $39.99. This one is made from a very resilient fabrics and it is a blend of polyester and spandex. It is manufactured with a very resilient fabric and constructed to hold up to endless training sessions. The Hypnotik Stereostar will control moisture and help you stay dry. Moreover, due to its antimicrobial technology, it inhibits the growth of bacteria and fungi. Plus, it protects against cuts, scrapes, and rashes. It is available in blue, red, and black color for $39.99. This is the most innovative compression garment in the combat world. It is designed from exclusive, cutting-edge fabric technologies which provide comfort and flexibility. Moreover, it has an anti-odor performance and it exceeds in durability. The Hayabusa Metaru 47 Silver Rash guard will protect you from cuts, scrapes, and rashes. Moreover, it keeps your body dry and warms your muscles. It is available in different colors and sizes and it costs $34.99 – $69.99. 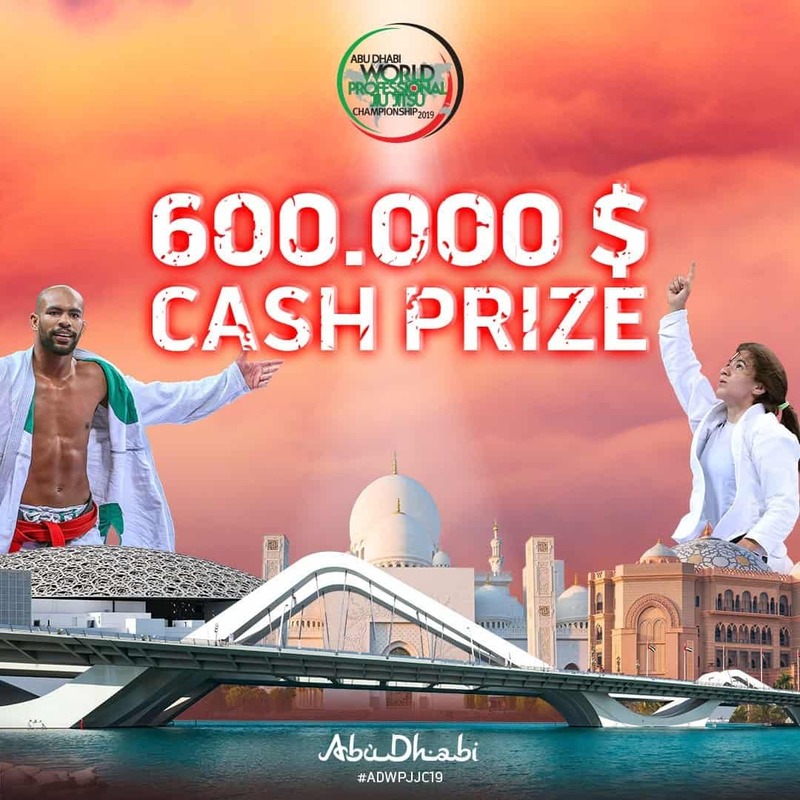 This is an extremely popular in grappling. It was designed by the talented Chris Burns and it was made from a high-quality material. It depicts a monkey in the thinker pose atop a fallen competitor. This rash guard is made from 91% Nylon and 9% Spandex. It can be machine washed. It is a long-sleeve rash guard with raglan seaming. It features contrasting screenprints at front chest, lower right sleeve, and back yoke. The RVCA Men’s Exclusive VA is available black and lava color for $27.30 – $39.99. 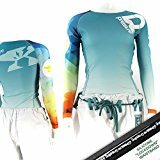 This is a great women’s rash guard for training, swimming, surfing, and CrossFit. It is made from a WikPro polyester and spandex fabric with 4-way stretch. It has a silicone lockdown no-ride up band at hem. Moreover, it contains permanently sublimated graphics which are finished in durable 4/6 flat lock stitching. The Pressure Grappling Women’s Premium is available in different sizes and in three colors: electrik, spacesuit, and trianglow. It costs $49.99. This rash guard is made from Venum compression technology, which can improve blood flow to the muscles and speed up your recovery time. Moreover, it controls body heat and it is durable. 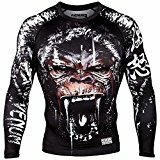 The Venum Gorilla Rash guard has a fitted cut with reinforced seams. There is also a rubber band located at waist for keeping your rash guard in place. 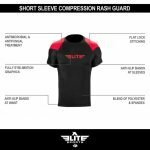 Ellite Sport Rash guard is a multipurpose compressed shirt which means that can be used for a wide range of sports, such as MMA, BJJ, No-Gi, Boxing, Kickboxing and Cross Training. It’s made of a high-quality blend of polyester and spandex and it has anti-slip bands at the waist and sleeves. The provides antimicrobial and antifungal treatment and features a fully sublimated graphics. 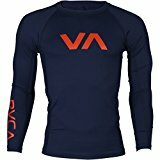 This rash guards will improve your performance and speed up your recovery time. Moreover, it is IBJJF and EBI approved and it is durable and comfortable. 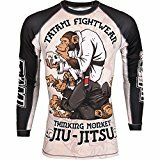 If you decide to wear a rash guard and enjoy a better grappling training, these 8 rash guards are the best ones you can find. Choosing any of the above-mentioned products will provide various benefits which will make your training more enjoyable. Which one you will choose depends on your taste and preference. We bet you enjoyed this article, take a look at this 8 of the Best Mouth Guards for BJJ and Grappling.